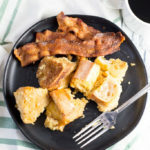 This overnight french toast bake makes an easy breakfast treat for a crowd. You assemble it the night before, let it sit in the fridge overnight, and just throw it in the oven in the morning. Heat a small saucepan over medium low heat. Add the butter and brown sugar, stirring constantly until the butter is melted and the brown sugar is mixed in. Spray the bottom of a 9"x13" casserole dish with non-stick cooking spray. Pour the butter and brown sugar mixture into the dish and spread it evenly. Add the bread pieces to the dish on top of the butter/brown sugar mixture, spreading evenly. In a large bowl, whisk together the eggs, milk and vanilla until fully combined. Then pour over the bread pieces in the pan. With a large spoon, press the pieces of bread down to ensure that all pieces are coated. Sprinkle a little cinnamon over the top. Preheat the oven to 400 degrees F. Remove the plastic wrap and bake for 45-50 minutes, until the edges are brown and crispy.